March | 2014 | Not Your Average Hockey Blog. Interview With Dennis MacInnis of ISS Hockey! We recently caught up with Dennis MacInnis of ISS Hockey. Dennis is currently the Director of Scouting of ISS Hockey. ISS Hockey is the world leader in independent scouting and information services on hockey prospects. It’s clients include NHL teams, Hockey Canada, and TSN. Dennis is considered one of the world’s top scouts and has been featured on websites such as CBS New York. 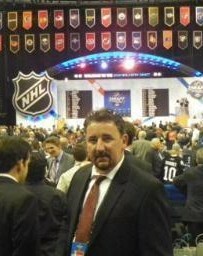 If you want to see more of Dennis’ work, make sure to log on to http://www.isshockey.com/ and read more! If you want to see more of our work, make sure to share, and “like” us on Facebook here: https://www.facebook.com/NotYourAverageHockeyBlog or you can alternatively follow me on Twitter: @HkyBlogger! Editor’s note: This is more of an unusual interview; even from our point of view. We wanted the reader to learn about top prospects in this year’s draft, but still get a chance to learn about drafting and scouting in general. We hope you like it either way! We also decided to take tweets from the ISS Hockey account to make sure you could have a brief scouting report on each player! Who has the biggest upside in this year’s draft? Aaron Ekblad. He is a stud best defenseman available by a wide margin. In 2012, Mark Jankowski was picked by Calgary Flames with the 21st pick. He was not expected to get drafted at such a high pick. Is there anyone you think may be listed a bit lower, but may be picked higher than expected? Kevin Fiala. He is a Swiss speedster currently playing in Sweden. He has been steadily moving up rankings since November. Fiala is currently ranked #32. He also played on Team Switzerland at the 2014 World Junior Championships and led the team in scoring. He is a highly skilled, crafty offensive player with very good play-making ability that makes those around him better. Who is the highest risk-highest reward player available? Who is the sleeper pick in this year’s draft? Dylan Larkin. He is better than people think. He has excellent leadership ability! Of the top picks available this year, who do you think would benefit from some seasoning? Sam Bennett. He will need time to add size & strength. Of the goalies available this year, who do you think is the most NHL ready? Thatcher Demko. He is mature and already pro size. He graduated a year early from high school to attend university a year early for Boston College. Which prospect available this year is the most NHL ready? Aaron Ekblad would be most NHL ready. Are teams scared to draft Russians because of the KHL threat? Yes, but that will not stop teams from drafting Russian players. What goes on during the “psychological testing”? What kinds of questions are asked? Teams are trying to get feel for kids character/personality traits/maturity/interests/likes/dislikes etc etc. One regular question is “If you won million dollars what would be the 1st thing you do?” A good answer would be to look after their parents & a bad answer would be to buy Mustang car with 500 horsepower. Why is psychological testing and interviews such an important part of scouting? Its very important because of the amount of money and time teams are looking to invest in each kid they draft. Teams use these test to try and determine the core components of a person’s psychological problems, learning disabilities, personality, IQ, or some other components. It is also a process that helps identify not just weaknesses of a person, but also their strengths. You often hear the term “intangibles” used often. What are intangibles? They are the little things a player brings to the game to help their teams win – Such as work ethic, hits, blocked shots, giveaways, takeaways, etc. The Boston Bruins and St. Louis Blues seem to be separating themselves from the rest of the NHL recently, so much so that I’m betting on them meeting to square off for the 2014 Stanley Cup. The Bruins have won 12 in a row while St. Louis is 7-2-1 in their last ten games, with a shutout over Sidney Crosby and the Pittsburgh Penguins on Sunday. With about ten games remaining in the season Boston and St. Louis are poised to finish the regular season strongly, and while it may not seem like a bold prediction to bet on the top team from each conference meeting in the Stanley Cup Finals, such a scenario has not happened since New Jersey and Colorado met in the Finals in 2001. What makes me think this year will be different from most others and the Bruins and Blues will carry their regular season success through the end of the season and into the playoffs? The answer is that both teams are amongst the deepest and most balanced teams the league has seen in some time. The Blues were considered a favourite to contend heading into this season and have lived up to expectations. The young team has been on the cusp of entering the league’s perennially elite for a couple of years, and a deep playoff run will cinch their status in that regard. While the goaltending tandem of Jaroslav Halak and Brian Elliott was certainly more than adequate throughout the year – Elliott was in net today to shutout the Penguins – upgrading Halak to Ryan Miller just before the trade deadline has assured that the team has no cracks. On defense, head coach Ken Hitchcock has an arsenal of talent for any situation at his disposal. Recent gold medal winners Alex Pietrangelo and Jay Bouwmeester are supremely skilled and log a lot of minutes, and Barrett Jackman is a proven leader who is difficult to play against. In fact, the Blues don’t have any easy defensemen to play against – Kevin Shattenkirk is the smallest of the lot, but at 5’11” and 207 lbs he is no pushover. Up front, the Blues epitomize the new NHL – a team that lacks a designated offensive dynamo and instead relies on an offense by committee. Ken Hitchcock is known for getting players to buy into a system that relies on responsible forwards that worry about keeping the puck out of their net before putting in the opposition’s. A surprise 30-goal season from Alex Steen and a sophomore jump from Jaden Schwartz has made this an offense that could afford the departures of Chris Stewart via trade and Vladimir Tarasenko due to injury. But when the playoffs roll around the experience of veteran agitators Brenden Morrow, Steve Ott, and Max Lapierre will make a big difference for this team. Morrow and Lapierre have each reached the Finals in their careers, and Morrow was part of the gold medal winning Team Canada at the 2010 Olympics. Playing against these guys for four to seven games will definitely take its toll on opposing forwards. And in case things get rough, Ryan Reaves is the team enforcer in charge of keeping opposing forwards in line, but he’s a modern NHL enforcer, one that doesn’t hurt his team if he steps on the ice and doesn’t drop his gloves. While the Bruins are similarly strong from the net to the fourth line, they are a much more experienced team than the Blues, having reached the Stanley Cup Finals two of the last three years. In fact, the biggest obstacle between the Bruins and the Stanley Cup Finals may be the fatigue resulting from their recent success. In addition to last year’s Finals visit, many of the Bruins’ star players didn’t get a break during the Olympics this year – Patrice Bergeron, Loui Eriksson, and Tuukka Rask all medaled at the Games, while Zdeno Chara and David Krejci played major roles for Slovakia and the Czech Republic, respectively. But only time will tell how much of a role fatigue will play against the B’s. Right now they are rolling along comfortably. Only two of the wins during their twelve game streak have been decided by less than two goals. Jarome Iginla is using this year to postpone an offensive decline, while Carl Soderberg has emerged as an underrated third liner that the league will likely take greater note of if the B’s go on an extended run this post season. While the importance of fisticuffs is greatly diminished in the playoffs, the Bruins have more grit than any team in the league, and it doesn’t hurt that they have three legitimate heavyweights – Chara, Milan Lucic, and Shawn Thornton – that draw regular shifts. The teams played twice already this season, and both games required extra time, the Blues winning 3-2 in each case. Ultimately, the Bruins and Blues are successful because they have rosters of smart players that minimize mistakes, and play the type of risk averse hockey that wins games. When opposing forwards do break free they have the unenviable challenge of putting the puck behind two of the best goalies in the league in Miller and Rask. They have the luxury of rolling four strong lines, and that is the only way teams can make deep runs in the playoffs in the NHL these days. If the Bruins and Blues do face off in June it will be the first meeting between the two teams since 1970 when Bobby Orr scored the Stanley Cup winning goal in overtime before flying through the air in celebration in one of the NHL’s most famous photos. While a meeting this time around would likely be much tighter than the four game sweep in 1970, it would likely be every bit as classic. We recently caught up with Charlotte Checkers’ forward Brendan Woods. He was drafted in the 5th Round (129th Overall) in the 2012 NHL Draft. He decided to play for the University of Wisconsin for two years after juniors. He’s a great guy and he’s an even better Twitter follow so make sure to follow Brendan on Twitter @SkeeterWoods21, and make sure to like us on Facebook and follow me on Twitter: @HkyBlogger and https://www.facebook.com/NotYourAverageHockeyBlog. Without further to do, here is our interview with Charlotte Checkers forward Brendan Woods. I guess I’d consider myself as a power forward, a guy who tries to create energy every shift, whether it’s a big hit or driving hard to the net to get a greasy goal, or if need be to drop the gloves for a teammate. So you’ve been in a few fights, how do you justify getting hit in the head repeatedly? Yeah I haven’t been into too many so I haven’t been hit too many times in the face but when it happens you don’t necessarily feel it until after the fight because of the adrenaline. You’re from Canada, but you decided to play junior hockey in the USHL and not CHL like many other Canadians. Why did you choose that route instead? Yes I was born in Canada but I’ve have lived most of my whole life all over the states. So for me it was an easy decision to pick the USHL over CHL because it gives me more options for my future. You can only play hockey for so long and with the USHL it gave me a chance to go to a Grade A college; Wisconsin to play great hockey and also get a great education to fall back on after I was done playing. 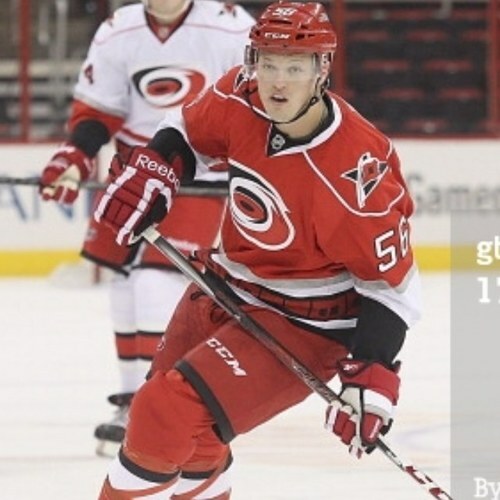 You were drafted in the 5th Round by the Carolina Hurricanes in 2012, where were you when you found you were drafted and what was running through your head when it all happened? I was in bed in my apartment, and I got a phone call from one of my teammates at the time, Mark Zengerle letting me know that I was drafted. At first, I thought he was talking about being drafted into something we had going on at our local bar on campus called the Kollege Klub, but then he goes ” No man, Carolina Hurricanes drafted you into the NHL!” so I was a little blindsided by it at first because I hadn’t spoken to any teams throughout that previous season, but at the same breathe I was on Cloud 9. Its every kid’s dream to get drafted in the NHL and it was surreal for me. You scored your first professional goal this year. Where is the puck? It is currently sitting on my Xbox in my room right now haha. What has been the highlight of career? I’ve had a few highlights; one would have to be playing overseas for my country in a tournament with a lot of star players, such as Justin Faulk, Nick Bjugstad, and Derek Forbort. Another was winning our league championship last year with Wisconsin and playing outdoors as well in Soldier Field, and obviously being drafted in the NHL and play my first game professionally was pretty cool! My biggest lowlight in my career was when I broke my femur and dislocated my knee in the fall classic my first year of junior, and being told by doctors my playing career could be over. The next part is more of a rapid fire round, it’s where the reader gets to really know you. Your dad played professional hockey. Any tricks you learnt from him? I don’t know what you mean by tricks but he has helped me tremendously through a lot of obstacles every player goes through just from his past from when he played. What’s the scariest thing you’ve seen on the ice? Thankfully I haven’t seen anything too scary while I was playing but just the other night seeing Rich Perverley go down on the bench might have been the scariest for me. Haha my celebrity crush……hmmm I have a few. My top 5 are Minka Kelly, Jennifer Aniston, Blake Lively, Julianne Hough, and Selena Gomez. My roomie on the road is Victor Rask, who is from Sweden….. Great guy and is single for all the ladies wondering hah. Every team does pranks, and I’m sure that the Charlotte Checkers are no different. What’s the best prank you’ve seen or been a part of? There’s always the usual shoe checks at the odd dinner, but I did get Chris Terry on a phone call break that was a recording that would call any number you put in and it was a recording of a guy asking him why he was calling his girlfriend. At first, I didn’t think I got him, but the next day the guys told me he was describing it to all of them at the back of the bus and saying how nervous he was not knowing who this random guy was confronting him of something he didn’t do. So we all got a few laughs out of that. Your Twitter username is @SkeeterWoods21. What’s the story behind it? Every freshman at school gets what they call Gomer Names selected by the seniors so that’s what i was given and it stuck and for some reason I decided to use that as my twitter account. For the most part my days off are pretty low key, I just like to lay low and sit on the couch and watch TV. give the body a rest, maybe a hot tub at night is always a good choice. Advice id give to kids would be do always have fun when you’re out there and to never take it for granted because you never really know when the last time you’ll be able to play the game. It has been an up and down season for the Vancouver Canucks, spanning a 7 game winning streak during the month of January, to losing 7 in a row through the month of February, where the offence mustered just 7 goals combined in these losses. As Deadline Day approached, it became clear that the Vancouver Canucks would not be a Cup Contender with their anemic offensive presence. Rumours surrounded star center Ryan Kesler, who reportedly wanted a trade out of Vancouver Something had to be done to stop their freefall in the standings. And so, a day before the NHL Trade Deadline, franchise goaltender Roberto Luongo was traded, alongside minor leaguer Steven Anthony, to the Florida Panthers in exchange for prospect goaltender Jacob Markstrom and Shawn Matthias, ending the 21 month goaltender soap opera surrounding Luongo and his “untradeable” contract. To me, this move signified the end of the Canucks’ desire to contend for the postseason this year. The return for Luongo is hardly considered significant enough to make an immediate impact for this team, given that Markstrom has struggled in his first stint within the NHL, and Matthias has never scored more than 14 goals in a season. All signs from this trade point to Canucks management hoping for long term gain from this deal, but I am of the opinion that this trade was lacking in value, and fails to address Vancouver’s need for forward depth for the future. But perhaps the most significant move was the one that never materialized, as Ryan Kesler stayed put on the Canucks after hours of speculation linking his name heading to the Penguins, Flyers, and Ducks. Personally, I felt that the rebuilding process for this team would have been centered (pardon the pun) around Kesler. He is unquestionably the best player on the Canucks, playing in just about every role the team needs him to. You just don’t get rid of versatile players like him. In addition, the deals that surfaced to acquire Kesler’s services, particularly from Pittsburgh, were sorely lacking in value, and would have been another unnecessary step back for Gillis and his struggling team. As if it wasn’t apparent enough from the middle of this season, the last several days have cemented the Vancouver Canucks as a team looking to restructure, rebuild, whatever you want to call it. This is a team that is no longer considered as a powerhouse in the Western Conference, no longer a threat to light up opponent goaltenders, and no longer able to contend for the Stanley Cup. Luongo’s departure is a start of a new era for this franchise, leaving behind more questions surrounding the future than there are answers. Thanks for reading everybody! My first post here on Hockey Blogger, it’s an honour to be a part of this blog! Feel free to follow me on Twitter @JaseeAu, and leave a like on our Facebook page at https://www.facebook.com/NotYourAverageHockeyBlog ! I’m heartbroken and angry. I’m heartbroken to lose a man that gave his heart and soul to this team and this community for 13 years. I’m angry, not but at Marty. I’m angry all the fans that have been bad mouthing Marty despite 13 years of devotion to this team and this community. I’m angry at Yzerman for the way he handled this situation. Marty is a wonderful man. His leadership skills far outshined Vincent Lecavalier’s in recent years. He should have become captain a long time ago. He is a shining example of what can happen if you work hard to achieve your dreams. 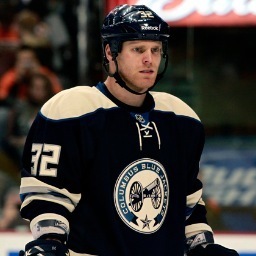 He was undrafted because he was too small, but still managed to make it to the NHL and win a Stanley Cup. I don’t blame him for requesting a trade after Yzerman left him off the initial Olympic roster. For every hockey player, winning an Olympic medal is a dream and to lose that dream twice after putting years and years of hard work and being more than qualified, had to be devastating. However, to say that that was the ONLY reason he requested a trade is absolutely absurd. Marty has won two Lady Bing trophies and was still gracious and classy when he made a statement to the fans/media about the trade. In an interview with Fox in Tampa, and in a letter to fans Marty thanked fans for their support and came across as very melancholy. Despite both of those statements saying that family was a big part of the decision, many fans, including some local journalists proceeded to bash him. They called him a crybaby, prick and douchebag just to name a few. They said he chose a personal vendetta against Yzerman over acting like a team player. This makes me angry because like I mentioned before knowing what I know about Marty’s character, that would not be the only reason for his request. Of course the media doesn’t see it that way because this personal vendetta story makes for “better” journalism. The fans are blindly believing the crap that makes for “better” journalism and can’t seem to think for themselves and realize that Marty is a real person with a real family and could possibly leave Tampa for any other reason. My anger is just magnified by the way Yzerman handled the situation. I already dislike Yzerman but after watching his press conference after the trade was announced, I absolutely hate him. 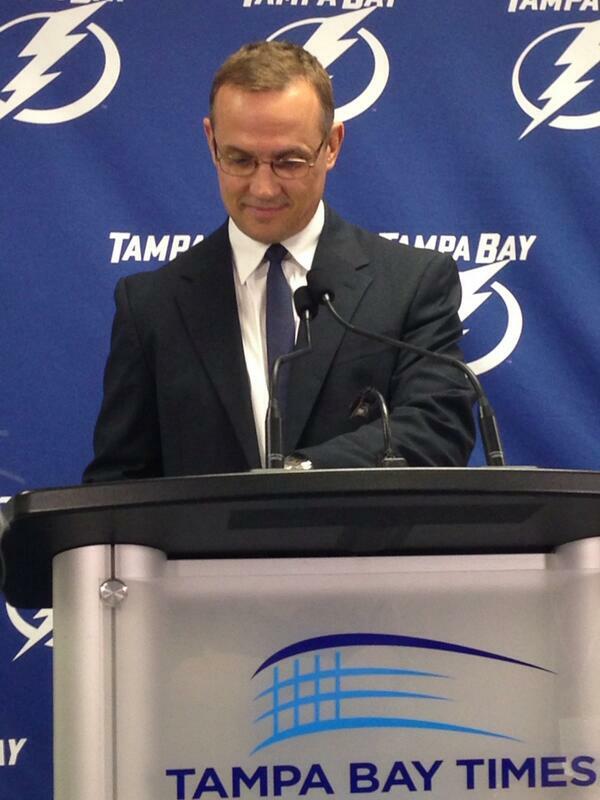 He talked about a “new era” in Lightning history now that every player from the 2004 Stanley Cup team and the smug look on his face made it seem like this was the final stage of his evil plan to purge Tampa of all of our beloved players under the guise of making the team better. He acted like he was glad Marty requested a trade, even though his words said otherwise. It was no secret that Marty and he didn’t have the best relationship. When asked if the snub had an effect on Marty’s choice to request a trade, Yzerman responded by saying snub means to ignore and that they didn’t ignore anyone. In fact, snub can also mean “reject with disdain or contempt.” During the press conference, the phrase “the best thing for the organization” kept coming up and I can’t help but wonder how the rest of the team will handle this and keep pushing toward the playoffs. Stamkos is feeling a lot right now, as he made clear in an interview. He feels the pressure leading this team, as well as the loss of a good friend and teammate. All of this happening after finally being cleared to play after being injured for 4 months. Overall, I’m bummed that Marty is gone and the Lightning didn’t get anything to help the team in return except for some draft picks that won’t be NHL ready for 5 years. I grew up supporting the Lightning, but this is Florida, not Canada. People won’t keep buying tickets and merchandise if it is going to take 3 years or more for the system Yzerman has been building to start making the team a constant contender for the Cup. With only Stamkos left to be the face of the franchise will the franchise be profitable enough to last until then? Only time will tell. Good Luck to Marty in New York.